Sturdy grab handle. External zipped pocket / accessory pouch. Holds up to 30 x 12” Vinyl Records (25 with laptop). Ideal for the record buying trip or the shorter DJ gig. Shoulder strap for ease of carrying. Well made nylon bag all double stitched for strong long life and thick bottom padding. These great record bags can hold up to 35 records. 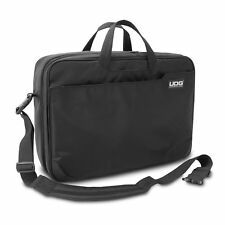 UDG CourierBag Deluxe Black 35/40 Vinyl Record & Laptop Padded Shoulder Bag. Technics Retro DJ Bag. Retro detailing. Outer pouch pocket. Can holds 35 x 12” Vinyl. Perfect for college folders/books. 37 x 37 x 12 cm. Reinforced stitching. Ibiza Airways Retro Messenger Bag - General Use + holds 12" DJ Vinyl & more! 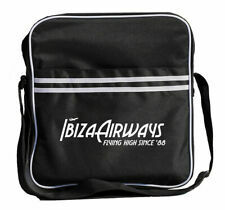 The IBIZA AIRWAYS Retro DJ bag is suitable as a dj bag or as a general use bag. 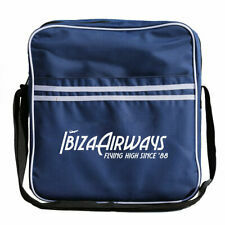 IBIZA AIRWAYS Retro DJ Bag. Retro detailing. Can holds 35 x 12” Vinyl. Outer pouch pocket. 37 x 37 x 12 cm. Reinforced stitching. Floor Monitors. Live Sound Accessories. Stitched Carry Handle. How do I find the item number or product code?. What if I have not received my order?. Why Use SoundSak?. Can I reserve item(s) that I intend to buy later?. 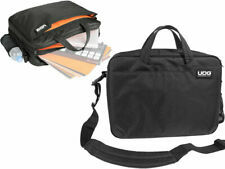 UDG Courier Bag Deluxe Black/Orange 35/40 Vinyl Record & 15" Laptop Shoulder Bag. Padded shoulder / 420 d polyester carrying bag in black with an orange Interior for a MIDI controller such as such as APC 40 / 20 or A & H Xone DX and a laptop with up to 18.4-inch. Suitable for: * NI machine Studio * novation 25SL MK2 * Reloop Beatpad 2 * Reloop Jockey 3 remix * Reloop mixage IE * Numark Mixtrack Pro 2 * Denon DN-MC6000 MK2 * Allen & Heath Xone 4 d * Hercules DJControl Jogvision specifications: * padded compartment for MIDI controller (such as Akai APC40/20, A & H Xone DX) * padded laptop compartment for up to 18.4-inch models * 1 front pocket for accessories * 1 page mesh pocket for water bottle * 2 solid handles above * ergonomically shaped and detachable shoulder strap * loop at the back for mounting on a trolley *. 40 records or a notebook and 35 records fit in this sturdy nylon bag. A case not only for DJ's. Finally a nice variation for notebook owners. -Space for 35 or 40 LP - rugged nylon-material padded laptop pocket, removable - large pocket in the front area with pen holder - detachable mobile phone pocket on the outside - water bottle holder on the outside - shoulder strap, removable, adjustable - in 6 colours available - for notebooks up to 22 x 25 x 5 cm mass (W x H x D): indoor cm: 35.5 x 33 x 9 inch: 14 x 13 x 3.5 outdoor cm: 39 x 34 x 15.5 inch : 15.4 x 13.4 x 6.1 weight: kg: 1.4 lbs: 3. SoundSak SOUNDSAK Speaker Bag Universal Fit Cover Case. Condition is New. Dispatched with Hermes Tracked. Retro detailing. Outer pouch pocket. Can holds 35 x 12” Vinyl. Perfect for college folders/books. 37 x 37 x 12 cm. Reinforced stitching. Over Shoulder Carry Strap. Can I reserve item(s) that I intend to buy later?. Active PA Speakers. How do I find the item number or product code?. Need more information?. What if I have not received my order?. Record bag holds up to 40 records. Vinyl Capacity 40. Authorised dealers - full technical support. Online since 1997. 9am-6pm, Mon-Sat. Adjustable Mukatsuku 12" record bag in navy holds approx 25 records. Vinyl Capacity 25. Authorised dealers - full technical support. Online since 1997. Colour Blue. Hard/Soft Case Soft. 9am-6pm, Mon-Sat. Over Shoulder Carry Strap. Stitched Carry Handle. Live Sound Accessories. Can I reserve item(s) that I intend to buy later?. How do I find the item number or product code?. Need more information?. Why Use SoundSak?. Adjustable Mukatsuku 12" record bag in olive green holds approx 25 records. Vinyl Capacity 25. Handle Type Adjustable shoulder strap. Authorised dealers - full technical support. Online since 1997. Colour Green. Stitched Carry Handle. Can I reserve item(s) that I intend to buy later?. How do I find the item number or product code?. Why Use SoundSak?. Product Code: XXA2964. When will I receive confirmation of my order?. Can I reserve item(s) that I intend to buy later?. How do I find the item number or product code?. Speaker Hardware. What if I have not received my order?. Effects Fluid. Pairs of Speakers. Speaker Cables. OFFICIAL DEALER UDG. -Compatible with: Pioneer DDJ-WeGO3, NI Traktor S2 MK2, Akai APC40 Ableton MK2, Push, Reloop Jockey 3 Remix, Reloop Beatpad, Maschine & Maschine Mikro. Compatibilità Lettori CD/MP3. Marks & Spencer Brand New, CD case still with label on. Shoulder strap also for carrying. Very nice, would make a nice present. The warranty covers manufacturer faults and does not cover misuse of the item, for example a 'blown out' speaker. Can I reserve item(s) that I intend to buy later?. How do I find the item number or product code?. The back side has a small zipper pocket for personal accessories. Vinyl Capacity 40. Detachable phone pocket. Authorised dealers - full technical support. Online since 1997. 9am-6pm, Mon-Sat. 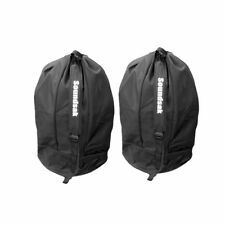 Introducing the new SoundSak-Mini, the smaller sized, universally fitting carry bag, that takes care of your speakers, or other equipment's transportation needs, with no fuss or frills- just as you need it - when you need it. The perfect solution for all mobile DJ's, bands, and live performance artists in general. OFFICIAL DEALER QUIKLOK. Nylon bag for two type S/SP/171, 180, Strix SS100. Materiale Nylon. Compatibilità Stand S-171 O SP-180. Adjustable Mukatsuku 12" record bag in black holds approx 25 records. Vinyl Capacity 25. Handle Type Adjustable shoulder strap. Authorised dealers - full technical support. Online since 1997. Colour Black. OFFICIAL DEALER UDG. Compatibilità Laptop 17". Pioneer DDJ-400/SR2/RB/RR/SB3. -Color: Black/Orange. -Weight: 2 kg. Two carry handles. The warranty covers manufacturer faults and does not cover misuse of the item, for example a 'blown out' speaker. Can I reserve item(s) that I intend to buy later?. How do I find the item number or product code?. Key Points. Live Sound Accessories. Can I reserve item(s) that I intend to buy later?. How do I find the item number or product code?. Need more information?. Why Use SoundSak?. Deco Lighting. Smoke Machines. Key Points. Over Shoulder Carry Strap. Can I reserve item(s) that I intend to buy later?. Active PA Speakers. How do I find the item number or product code?. They couldn't have been more helpful and pleasant. Key Points. Full Length Zip Fastener. Carry Handles. The warranty covers manufacturer faults and does not cover misuse of the item, for example a 'blown out' speaker. Can I reserve item(s) that I intend to buy later?. Can I reserve item(s) that I intend to buy later?. How do I find the item number or product code?. When will I receive confirmation of my order?. Speaker Hardware. Passive PA Speakers. Effects Fluid. Speaker Cables. External zipped pocket / accessory pouch / iPAD pouch. Sturdy grab handle. Holds up to 30 x 12” Vinyl Records (25 with laptop). Technics Classic logo. Apart from looking cool and funky, this handy multi-purpose bag can also fit 10 x 12” records for all you crate diggers and vinyl junkies! Capacity 11 litres. 210 d polyester. Manufacturer Part Number TWB1. Mpn twb1. Funky Technics Bag. Very stylish Technics bag for everyday use! • Technics Classic logo. • Technics Classic logo. Funky Technics Bag. Very stylish Technics bag for everyday use! • Technics Classic logo. • Technics Classic logo. Packaged as new by an authorized dealer Technics. Brand Technics / DMC. Manufacturer Part Number TWS1. Mpn tws1. Funky Technics Bag. Very stylish Technics bag for everyday use! • Technics Classic logo. • Technics Classic logo. Manufacturer Part Number TWR1. Mpn twr1. Funky Technics Bag. 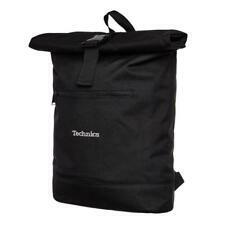 Very stylish Technics bag for everyday use! • Technics Classic logo. • Technics Classic logo. We handle warranty claims quickly. We will then get back in touch with you. 1 front pocket for accessories. Material: Polyester 420 D. Czech Republic (CZ) Spain (ES). United Kingdom (GB). Hungary (HU).